Co-defendant and key witness Jejoen Bontinck, left, arrives at the main courthouse in Antwerp, Belgium on Sept. 29. He is charged with being a member of Sharia4Belgium, which allegedly recruited fighters to go to Syria. This week, the trial of dozens of Sharia4Belgium members began in the Belgian city of Antwerp, ground zero of a very successful effort to recruit jihadists. The extremist group is a big reason why Belgium has the largest per capita number of fighters of any Western European country in Syria, according to the International Center for the Study of Radicalisation. 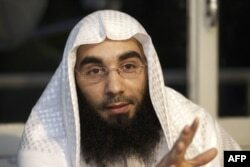 “Everything is apparently better than Belgium,” wrote Fouad Belkacem, the imprisoned leader of the disbanded Islamist group, in a statement posted to Facebook in 2013. It was a sentiment apparently shared by an estimated 300 to 400 Belgian Muslims who have reportedly made their way to Syria to fight. And Belgian fighters have been involved in some of the most high profile events unfolding in Syria. At one point, murdered American journalist James Foley was held by a group of Sharia4Belgium militants in Syria, according to a Belgian returnee fighter Jejoen Bontinck. He claims to have been held with Foley. Bontinck said he was being held because he wanted to return to Belgium. He claims he went to Syria for humanitarian reasons, not to fight. Belkacem, Bontinck, and dozens of other Sharia4Belgium members are currently on trial, charged with belonging to a terrorist organization and brainwashing young men in Belgium to fight in Syria. "Belkacem's words can only be interpreted as a call to violence and jihad," said public prosecutor Ann Fransen on Monday, listing a long line of speeches and videos in which he equaled military jihad to praying and fasting. Belkacem, who is of Moroccan descent, is currently serving a jail term for inciting hatred against non-Muslims, listened closely as the long indictment was read out, at times smiling and whispering to other defendants. Morocco is also seeking his extradition for a drug smuggling conviction. Prosecutors detailed how Sharia4Belgium members approached young men, and a few teenage women, on the streets of Antwerp and Vilvoorde, north of Brussels, to invite them to their center in Antwerp where they were indoctrinated and readied for their trip to Syria. Jytte Klausen, a Brandeis University professor and founder of the Western Jihadism Project which focuses on jihadi activities in the West, said in the latter half of 2013, going to Syria “became the thing to do” for many Sharia4Belgium members. But the goal appears to have been to field fighters. "The clear aim was to prepare them for armed combat," said Luc Festraets, a prosecutor. Pinning down the reasons Belgium became such a fertile recruiting ground for extremists is difficult. Other Western European countries have groups similar to Sharia4Belgium, but those did not prove as successful at recruiting jihadists. A major factor is Belkacem himself, who by all accounts is highly charismatic and was adept at exploiting hot button issues to bring attention and followers to his movement. Prosecutors at the trial said he cooperated closely with British Salafist activist Anjem Choudary, the former head of the now banned organization al-Muhajiroun, who was recently arrested by British authorities and later released. That organization gained notoriety for staging events to commemorate the Sept. 11, 2001 attacks on the United States with leaflets that referred to the hijackers as "the Magnificent 19". In Belgium, ill will among some Muslims began to simmer in 2009, when the city of Antwerp banned the hijab, or headscarf. In 2011, Belgium became the second country in Europe to ban women from wearing the full Islamic veil, the niqab, in public. Belkacem called the 2009 ban a “bomb” that contributed to the founding of Sharia4Belgium. In 2012, in an immigrant area of Brussels, a Muslim woman, Stéphanie Djato, was arrested by police for refusing to remove her niqab. Some Muslims took to the streets after the incident protesting what they called police brutality. One extremist came to Brussels from Paris and was charged with stabbing two police officers in a subway station. Police said the man carried literature about Sharia4Belgium. When right-wing politician Marie-Rose Morel died of cancer at age 38, the group said it was punishment from Allah. They also made veiled threats against other right-wing politicians, including an Internet death threat against the Belgian defense minister in 2011 because of Belgium’s participation military action in Libya. And there has been an anti-Islamic backlash in the country. Mosques have been vandalized with spray painted images of pigs, and the daughter or a right-wing politician provocatively posed in a bikini while wearing a niqab. According to Van Vlierden, another reason Sharia4Belgium was successful is that police, politicians and analysts did not see the group as dangerous. Bontinck’s father was so concerned about his son’s activities that he told CNN he called authorities but was told there was no law forbidding him from being a member of Sharia4Belgium. Last year, after telling his parents he was going to Cairo to study, Bontinck was in Syria. According to Van Vlierden, there is a lot of variety among Sharia4Belgium members, although the majority are from Moroccan descent because that is the largest group within the Belgian Muslim community. He said there are also members of Turkish and Chechen descent, as well as Muslim converts. Klausen said it is important to distinguish between what the militants say is their cause and what really drives them. Marion Van San researcher at the University of Rotterdam who researches families of youth who have gone to Syria said Sharia4Belgium acted like a “sub family” for some of the members. Van San also said many of the recruits have only a scant understanding of Islam and Arabic. Many would-be recruits get their knowledge of Islam from the Internet. “They get a black and white version of the world and that’s what makes it so dangerous,” Van San said. While a lot of Sharia4Belgium members who went to Syria had criminal records, the group is diverse. “The reasons why people go is almost as many as the number of people who go,” Van San said. While many of the Belgian fighters remain in Syria or Iraq, there are worrying signs they could return to wage jihad in Belgium. In May, a French national, Mehdi Nemmouche, who spent most of 2013 fighting in Syria, opened fire at the Jewish museum in Brussels, killing four. Some material in this report was written by Reuters.